This entry was posted in Awards, Family History and tagged cooking, decor, design, dolls houses, Family History, home crafts, one lovely blog award, Provence by cassmob. Bookmark the permalink. Congrats on Award – it’s well deserved. Thanks for the links to blogs outside genealogy – will take a look at them tomorrow. Hi Pauleen..thanks for the honor, I am thrilled to be nominated by you. And your blog is fascinating..I’ll read more. Love geneology, my aunt has traced us a crusader in England and a sea captain captured by French pirates in 1790’s. Just for starters! Have a gorgeous weekend! Congratulations on the award, and thank you so much for passing the award on to my blog! I’m honored. You beat me to it. I, too, have nominated you for the One Lovely Blog award. My list of fifteen nominees is on UK/Australia Genealogy. I look forward to reading some of the non-genealogy blogs on your list. We do need a life outside genealogy! Thank you very much for the nomination! I’m enjoying reading back through your blog and the other blogs on your list. 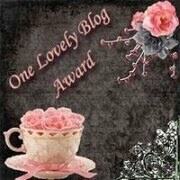 What a lovely way you presented the Lovely Blog award to all your recipients. I’m delighted to learn about your blog. I just read your spring post, which came after this one. I’ll post my comments there specifically, but thank you so much for the nomination. I’ll be sure to mention your site on my blog as well. It’s great to see the perspective from the other end of the world. would love to come to Australia some time!